Union Bank of India Armed Guard (Ex-Serviceman) Admit Card Check Here. Union Bank of India Notification is out. Union Bank of India is recruiting for 100 Armed Guard (Ex-Serviceman) Govt Jobs Posts. You can check Union Bank of India - Union Bank of India last date, download Union Bank of India notification, visit Union Bank of India official website and check other Union Bank of India Vacancy details.Complete Vacancy and recruitment Details about 100 Armed Guard (Ex-Serviceman) Govt Jobs vacancies in Union Bank of India are provided below by JobSarkari.Com only for you. Last Date of Apply Online. 18/02/2019. Last Date of Receipt Application Fee. 18/02/2019. Date of Admit Card. 01/03/2019. Mode of Payment. Candidate Need to Submit Application Fee Through Online Mode. Guntur 01 00 01 00 02. Barpeta 02 00 00 00 02. Dibrugarh 01 00 00 00 01. Kamrup 01 00 00 00 01. Begusarai 00 00 01 01 02. Patna 00 00 01 00 01. Chandigarh 02 00 00 00 02. Delhi 00 01 00 01 02. Ahmedabad 00 01 00 00 01. Gandhinagar 00 01 00 00 01. Kheda 00 01 00 00 01. Rajkot 01 01 00 00 02. Surat 01 00 01 00 02. Vadodara 00 01 00 00 01. Panipat 00 01 00 00 01. Jammu 01 01 00 00 02. Srinagar 01 00 00 01 02. Giridih 02 00 00 00 02. Belgaum 00 00 00 01 01. Ernakulam 01 01 01 00 03. Idukki 01 01 00 01 03. Kozhikode 01 00 00 00 01. Thiruvananthapuram 01 00 00 00 01. Bhopal 00 00 00 01 01. Jabalpur 00 00 01 00 01. Singrauli 00 00 01 01 02. Mumbai 02 01 01 10 14. Sambhalpur 04 01 00 03 08. Amritsar 01 00 00 00 01. Ferozpur 01 00 00 00 01. Hoshiarpur 01 01 01 00 03. Ludhiana 01 00 00 00 01. Pathankot 01 00 00 00 01. Chennai 02 00 00 00 02. Coimbatore 01 00 00 00 01. Madurai 01 00 00 00 01. Hyderabad 01 00 00 00 01. Karimnagar 00 01 00 00 01. Agra 00 02 00 00 02. Gorakhpur 00 00 02 01 03. Kanpur 00 00 01 01 02. Lucknow 00 00 01 00 01. Mau 00 00 01 01 02. Meerut 00 00 01 01 03. Dehradun 00 00 00 01 01. Nainital 01 00 00 00 01. Bardhaman 00 02 01 00 03. Kolkata 00 04 01 01 06. Total No. of Post 34. 21. 19. 26. 100. Armed Guard (For Ex Serviceman) Candidates Must Have Passed Class 10th or its Equivalent Exam But the Candidate Should Not Have Passed 10+2 Examination or its Equivalent. 18 to 25 Years. 1. Online Examination / Test. 2. Group Discussion / Interview. 7. Online Application Can be submitted On or Before 18th February 2019. Q. 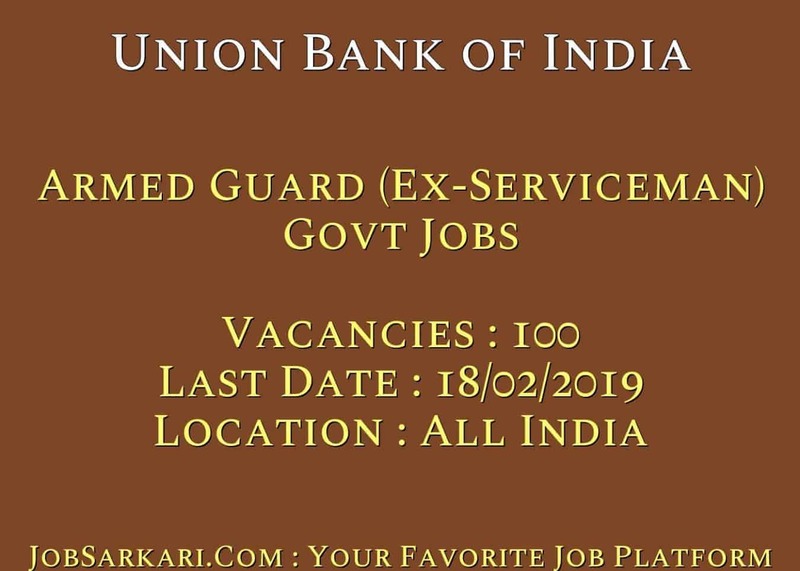 What is the Last Date For Union Bank of India Armed Guard (Ex-Serviceman) Govt Jobs Vacancy ? A. 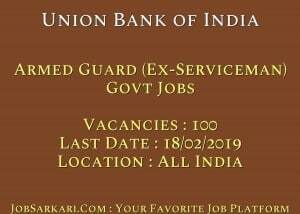 Last Date for Union Bank of India Armed Guard (Ex-Serviceman) Govt Jobs Posts is 18/02/2019. Q. What is the Form Type of Union Bank of India Armed Guard (Ex-Serviceman) Govt Jobs Recruitment ? A. The Form Type for Union Bank of India Armed Guard (Ex-Serviceman) Govt Jobs Posts is Online. Q. How many vacancies are available in Union Bank of India Armed Guard (Ex-Serviceman) Govt Jobs Posts ? A. There are about 100 Vacancies in Union Bank of India Armed Guard (Ex-Serviceman) Govt Jobs Posts. Q. What is the Full Form of Union Bank of India ? A. Full Form of Union Bank of India is Union Bank of India .